The UNIX shell provides a host of extremely useful utilities for modifying text. 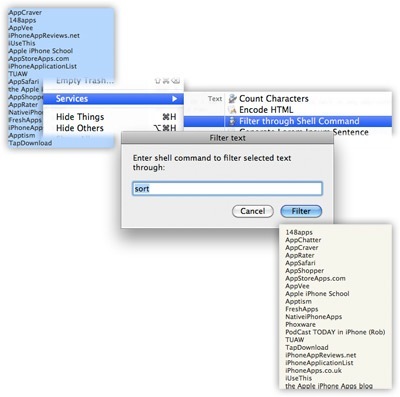 This OS X Automator service makes all of them available for filtering text in all OS X applications. This can be handy for performing quick operations, like replacing text with regular expressions, sorting lists or swapping fields around. When triggered, the service requests a command to use for filtering, then runs the command and replaces the selected text with the result. Change to lowercase: tr "[:upper:]" "[:lower:]"
Put it in Library/Services, and it should appear in the ‘Services’ menu. Mac, Scripts, Shell, Workflow. Bookmark the permalink. Both comments and trackbacks are currently closed. There appear to be a few products out there that are more targeted for normal users – A quick glance reveals two possibilities (I haven’t tried them): Text Wielder and maybe TextExtras. You can make that change pretty easily – if you double-click the workflow, it’ll open up in Automator; then you can replace all the text in the “Run Shell Script” panel with just your command (“sed ….”). Then save, and you’re done. I installed ‘Filter Through Shell Command’ in my user Library/Services, not the root Library/Services on my Mac OS X 10.6.3, but I do not see the ‘Filter Through Shell Command’. Does this run on OS X 10.6.3? What am I doing wrong? I did reboot and ‘Filter through Shell Command’ is checked under ‘text’ in Keyboard preferences and I still do not see the command when I go to Services. Removing the cat in the last line made it work for me. Thanks! This is great! Except it doesn’t seem to work in BBEdit, and Outlook (which unfortunately has the best AppleScripting support of any of the email clients) oddly loses window focus. Have you tried it with either of those apps? Not sure about this, I’m afraid – it does weird focus things for me in a couple apps too. Bit busy to look into it at the moment, but I’ll keep it in mind.